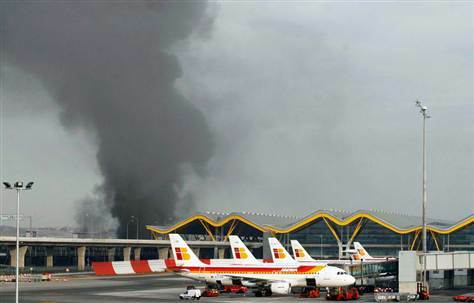 On the morning of 30th December 2006, a huge explosion took place in the car park building attached to Terminal 4 of Madrid Barajas International Airport in Spain. The explosion, from a VBIED (car bomb) containing 800 kilograms of explosive, killed two people and wounded 25. The attack was conducted by the terrorist group ETA, which has waged a long campaign of violence to seek independence for a Basque state. More than 800 people have been killed by ETA violence since the 1960’s. The airport received three telephoned warnings about the bomb in the hour before the explosion, and police were cordoning off the car park area when the device exploded, sending a huge pall of smoke over the airport terminal and sending terrified passengers fleeing from the airport.